Skill building is a driver of behavior change for healthy eating patterns. This is the eighth article in our series to illuminate key ‘drivers of behavior change’ around healthful eating. We design, evaluate and retool curriculum to increase successful behavioral outcomes among all ages. Over 20+ years of this work, we have identified 10 distinct behavior drivers. We are investigating these 10 drivers in a new study in collaboration with Columbia University’s Teachers College, Program in Nutrition. Our goal is to open a new area in the scientific literature that illuminates successful delivery and communication techniques. Because our programs are always multi-session, cooking skills have time to develop and take root. 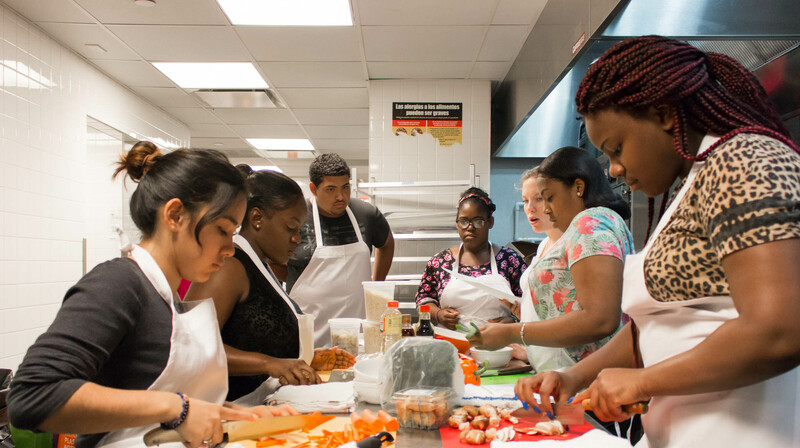 Before we know it, youth and adults begin to experiment with their new culinary skills at home. New vegetables are sought out, purchased and broken down with ease and pride. Multicultural recipes make their way into the family repertoire. And, bit by bit, new healthier habits and practices around food are established. Skill building is one way we foster self-evidence in participants. As a result, those who finish our programs want to change how they eat. What they now know and can do in the kitchen causes their preferences to change, when it comes to food. This is a huge shift. Bigger for some than for others. But huge as new foundation to build a healthier lifestyle. Without the development of new skills, the critical will to change will not take hold with any staying power. Thus, it’s critical for Teaching Kitchens to move away from demonstrations and into hands-on skill building. Watching is powerful; doing is transformational. And, as neuroscience reveals, with practice comes new habits and willingness to make big shifts over time. Our research tells us the success experienced around preparation of a new, flavorful recipe is a huge motivator for participants. They become excited to replicate their learnings at home. They’re driven to share with others. That’s because food we prepare ourselves is more enjoyable when it is shared. So, as you design your teaching kitchens, move beyond the demo station concept. Instead, adopt hands-on, modular type designs. Reach out to us if you need fresh ideas on ‘pop up kitchens’ and modular designs. Don’t box yourself into a restrictive kitchen configuration. You may want all ages in your kitchen over time. Build more flexibility in from the get-go – including with your curriculum. Your teaching kitchen program will be able to grow and develop with your success.